A longtime Purdue professor known as a committed teacher, a devoted researcher, an innovative mind, an inspiration to countless aerospace leaders, and a trusted and loyal friend died on Nov. 13. A longtime Purdue professor — known as a committed teacher, devoted researcher, innovative mind, inspiration to countless aerospace engineers and leaders, and a trusted and loyal friend — passed away on Nov. 13. George Palmer, emeritus professor and Purdue alumnus, was 97. After receiving his bachelor’s in aeronautical engineering from Purdue in 1945 and working in industry until the end of WWII and getting a graduate degree from Caltech, Palmer joined Purdue as an instructor in the Mechanical Engineering School in 1947. In 1948, Palmer transferred to the School of Aeronautics as it was then called and later was promoted to assistant professor and associate professor. 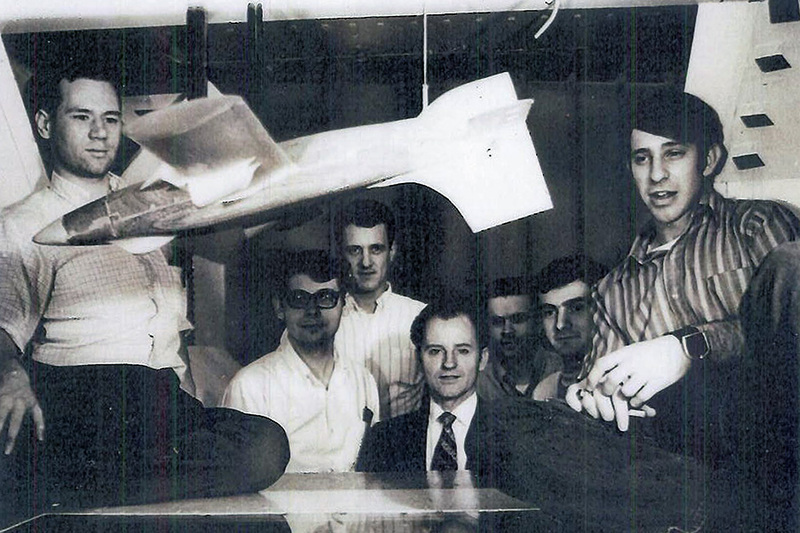 During his tenure at Purdue, Palmer taught Stability and Control, Airplane Aerodynamics, Jet Propulsion and Rocketry, Space Propulsion, and 490, 590 and 690 Special Individual Projects, all of which invariably used the wind tunnel he designed and built. He retired after 41 years of dedicated service in 1987. Palmer is best known for his work and tireless efforts in developing Purdue’s wind tunnel program, including designing and constructing The Boeing Wind Tunnel. 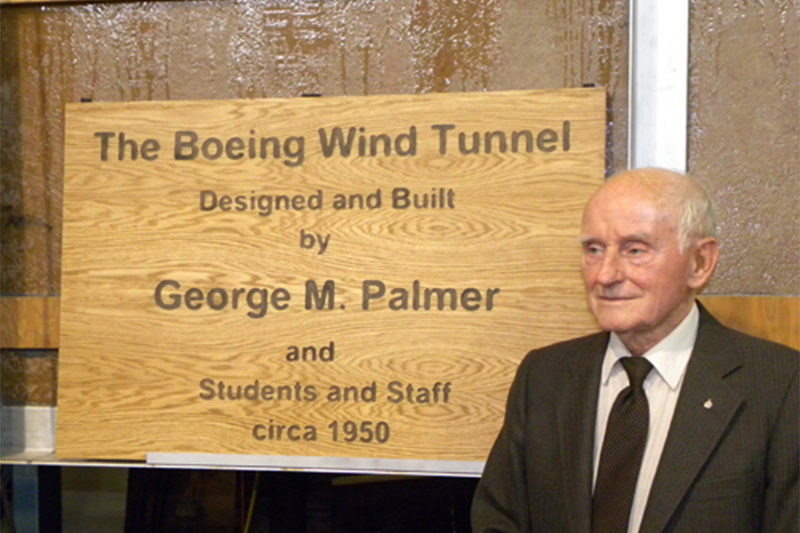 Former School of Aeronautics Head Elmer Bruhn assigned Palmer to design and complete the wind tunnel project, proposed as a vertical tunnel with the test section at a balcony level. With Bruhn’s approval, Palmer changed the design to a horizontal tunnel with the test section accessible at floor level. The faculty wanted a low turbulence tunnel to study boundary layer flow, which required the design of a strong structure to support taut fine screens. Palmer enlisted the help of students for drafting and assembly, as well as Purdue Physical Plant and outside contractors. The wind tunnel was completed in 1950. Later, Palmer modified it, configuring a 12-foot diameter turntable at the end of the diffuser to the 3x4.5-square foot test section and removing the “air exchanger” to provide an open test section for wind engineering studies. That change allowed Purdue to become one of few universities that could test building designs and post mortems that occur due to heavy wind. 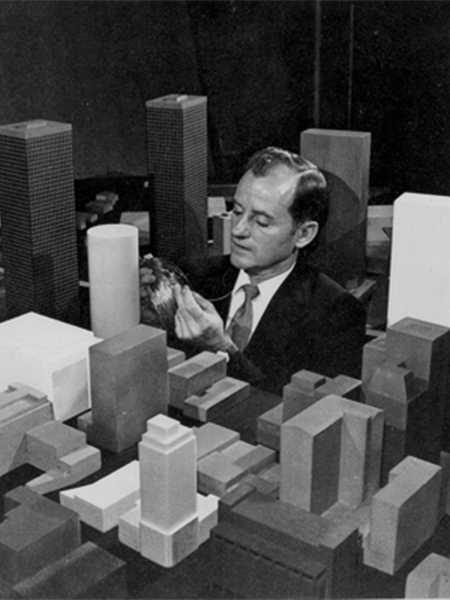 As a result, as many as 35 building designs were tested in the wind tunnel, including I.M. Pei’s Raffles International Center that was built in Singapore, the John Hancock Building in Boston, and the National Gallery of Art in Washington D.C. Palmer also tested the Super Dome that was built in New Orleans. But testing tall buildings for pressure distribution and forces, both static and dynamic, weren’t the only benefits after Palmer’s modification of the wind tunnel. His innovations of the tunnel also allowed testing of large scale Exxon Mobile Oil and Gas ships and a variety of truck models and Greyhound Bus models. Corso (BSAE ’71) made a career change decision during his senior year at Purdue, opting to pursue a law degree after graduation. Palmer had hoped Corso would consider graduate school in aerospace, Corso says, but Palmer still completed a reference form for Corso’s law school applications. More than 30 years after graduation, Corso reconnected with Palmer and Palmer’s wife Pat. Corso and George Palmer would speak on the phone, visit in person, chat during Outstanding Aerospace Engineer banquets — Corso was honored in 2011, Palmer in 2013 — and, eventually, email multiple times per week. Bill Uhrig, another former student, says, "I was lucky enough to get my AAE degree from Purdue and study with an exceptional group of professors. George has a special place in my heart because he gave me my first non-farm job assisting him at the wind tunnel. He took the time to explain to me the engineering and aerodynamics of each test and setup. I learned as much in that job as any course, which is a high bar." The Palmer family will host a memorial service from 3-5 p.m. on March 31, 2019, in Lafayette. Purdue’s School of Aeronautics and Astronautics will honor Professor Palmer at its Outstanding Aerospace Engineer awards banquet, held from 6-9:30 p.m. on April 2, 2019. In lieu of flowers, the Palmer family has designated Purdue’s School of Aeronautics and Astronautics for memorial contributions in memory of Professor George Palmer. Please make donations online HERE or donations can be made payable to Purdue Foundation and mailed to Purdue Foundation, 403 W. Wood St., West Lafayette, IN, 47907. Please indicate on the check the fund you wish to support: George and Patricia Palmer Undergraduate Scholarship Endowment or George and Patricia Palmer Design Teaching Assistantship Fund Endowment.